I spent my Saturday shuttling back and forth to Peterborough. There were two author-signing events at the local bookstore. I attend these to get a sense of what works in anticipation of the day I have a book signing of my own. The first woman had written a fictional novel that held little interest for me. I studied her body language and noted how long she read from her book then opened the discussion to the audience. There was a good-sized crowd so I was able to slip in and out unnoticed. The second was a bright, personable woman of my age. Her new book was a fictional account of a serial killer in California. But I noted an earlier work, a memoir, and bought a copy. There were lots of her friends and fans in attendance. After she set up the book and read for 10 or 15 minutes, she invited questions from the audience. The discussion turned to her memoir of several years ago. When she finished, a line formed as the audience rose to have their books autographed. I ducked out of line pretending to need to take a look at my iPhone. When I rejoined the queue I was last, right where I wanted to be so as not to be overheard. 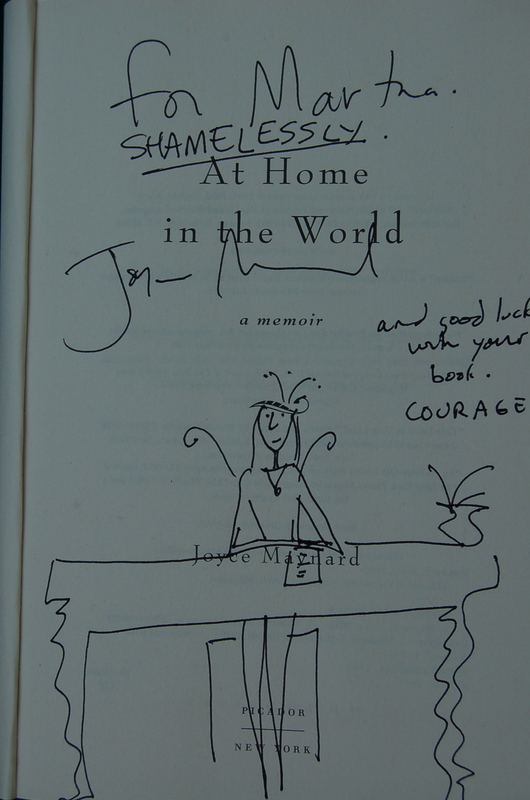 Joyce smiled up at me and took my copy of her memoir. “You look familiar do I know you?” “Not yet,” I replied. I have seen this before. My daughter Hanni was studying ceramics. When we attended the huge annual craft fair in Sunapee, NH last year, she was drawn to the different artists booths. Her questions about types of clay, glazes and firing techniques were answered one of two ways. Either the artist enthusiastically jumped into the conversation, educating and questioning, or they threw up a huge invisible wall and dismissed her. Why do artists and authors not recognize that someone took the time to encourage and see them when they were starting out? Why is there a sense of propriety and a refusal to acknowledge others? This entry was posted in publishing. Tagged Authors, book signing, faux pas, Joyce Maynard, Therapeutic Misadventures. She sounds like she thought you wanted a review or a “reader”. Especially the comment about people sending her stuff. Chin up. You’ll have your own day in the sun. Chris, if this is my only “day in the sun” I am happy. I just don’t get people who “make it” being threatened by others. Don’t let her get you down. She’s obviously insecure about her success. She apparently sees you as competition. I could tell you a story about how a “big” author with a book that competed with my second or third (really can’t remember which) deflated me. I still hold it against him all these years later. Because of the topics of my books — computer how-to — I soon learned that book signings weren’t for me. They invariably turned into a free computer help session for attendees, few of which bought books. It would be nice to have a signing where attendees were more interested than my work than picking my brain for solutions to their obscure computer problems. Do you have a publicist or is the publisher arranging signings for you? The faux pas was hers! I applaud you for still describing her as a “bright, personable woman” I probably wouldn’t have been as generous. She does not know you, but I think you got a good view of her!